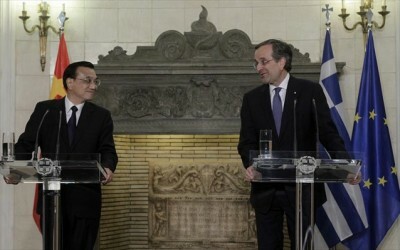 EU-China+Global dimension to PM Keqiang's visit to Greek PM, EU chair Samaras, eve of EU Summit ?! 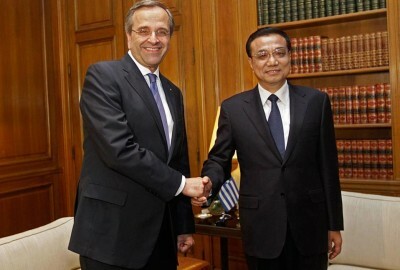 Home newsitems EU-China+Global dimension to PM Keqiang's visit to Greek PM, EU chair Samaras, eve of EU Summit ?! New, Strategic links between Trans-Continental Sea Ship Transports and Railroad/Airport transports' boost, as well as EU's Maritime policies, appear to be a central key in the latest, 6,5 Billions $ worth deals brokered between China and Greece, together with Wind Power and traditional quality Greek products, such as Parthenon-like White Marble, Mediterranean Olive Oil, special Wines, etc., as it results from what was anounced at the beginning of a 3 Days official visit by Chinese Prime Minister Li Keqiang, who meets with EU chairman-in-office, Greek Prime Minister Antonis Samaras both in Athens and in Pireas' Seaport, where planned vertical N/S Rail links with the rest of Europe are due to play an important role in the forseable Future, according to the latter. Better financial conditions for Ship Building in China by the Greek Ship Transport Economy, (almost 16% of the Global Merchant Fleet in the whole World), which is the Biggest Foreign client of Beijing/Shanghai in this domain Today, apparently goes together with a growing interpenetration and cooperation also on various Trans-Continental Shipping Business projects in the private sector. In addition, Maritime Scientific Research, Technology and protection of Natural Environment, are also included in the package anounced shortly before the forthcoming EU Summit of June 27 in Brussels, which was initialy scheduled to extend up to EU's Security and Growth policies in the Maritime sector, where China reportedly has more than 3 Million Square Km of "Blue" area, while the Oceans are expected to play an important role for Development in the World in the Future. 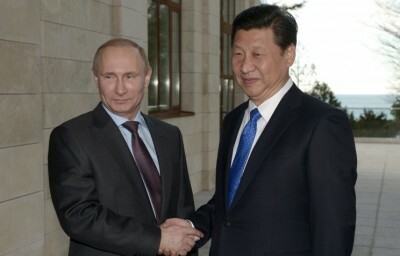 With 42 Years-long Diplomatic relations already since 1972, which evolved in a Strategic Partnership in 2006, while China's 1st attempt in the World to run a key overseas Port with COSCO giant's investments to Pireus Container Terminal since the beginning of 2009, which grew fast from 685.000 TEUs to 2,52 Millions between 2010-2013, ( i.e. Multiplied more than X 400 % ! ), the two complementary Countries offer a natural Bridge for EU - China links particularly in the domain of Maritime policy, on which PM Beijing's strategy is due to be presented by PM. 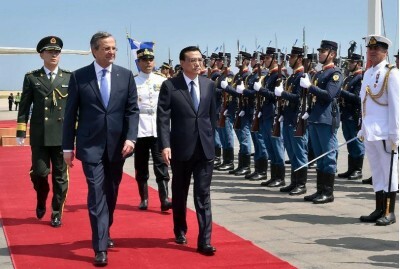 Li's speech in Athens' Maritime Forum, at the eve of the EU Summit of 26-27 June. 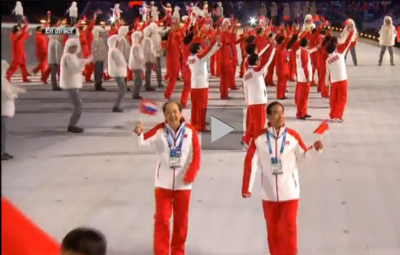 Cultural and particularly Geo-Political agreements between the two strategicaly located Countries, which already have close Cooperation on Olympic Games' hosting experience and projects, (and are perhaps unique in the World to have kept more or less some continuity with their respective over-Millenary Civilisations, that Ancient Greek emperor Alexander the Great had notoriously tried to Unite, arriving as far as North of India, already as early as since the 3rd Century BC, i.e. almost a Thousand Years before Italian Marco Polo from Venice finaly succeeds to do so with his Merchand and Writer's trips around 12.000 BC, through Greek-Byzantine Empire's capital Constantinople, followed by a Return back to Europe via... Maritime Ship roads), reportedly offer a fertile and adequately strong Context for such Economic deals. 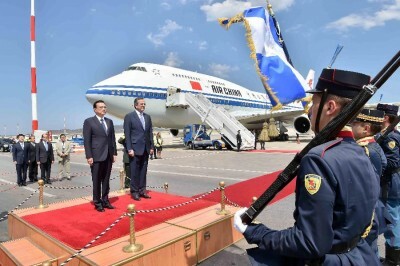 The boost thus given to Trans-Continental Maritime Transport by both China and Greece, (whose private Ship Owners have reportedly passed commands recently for more than 140 Ships to China, i.e. near to the Half of 378 Ships of Greek interests currently built accross the World, compared to more than 3.900 Ships controlled Today by private Greek Shipowners, with a Total Worth of 84 Billions €), in addition with a reportedly growing parallel Chinese interest for Greek State's Bonds in the forthcoming period, seem to table on a forthcoming European and Global Economic Growth, at least in certain key sectors. 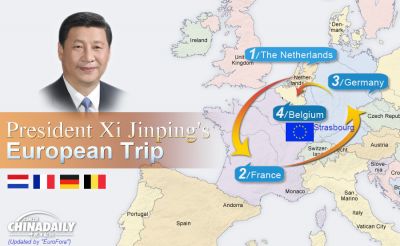 By a Symbolic coincidence, even the new President of China, Xi Jiping, (who strongly supported EU's role and EurAsian "Vision" in a Multi-Polar World during his recent 1st trip to the Franco-German core of EU's HQ in Brussels last April/May, hopefuly to be followed in Future also by a 2nd trip to Visit and Speak at a New EU Parliament's plenary session in Strasbourg, €uroZone's natural Center ; See "EuroFora"s relevant Draft-NewsReport, already sent earlier to Subscribers/Donors), is expected to possibly visit, together with his wife, a famous philanthropist and singer, some particularly beautiful and Historic Greek Islands at the Aegean Sea later this Summer, probably on July, according to informed sources. 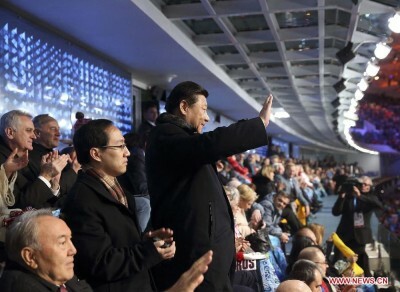 A Top Political boost for a Maritime-Link complement, (Marco Polo-like : Comp. 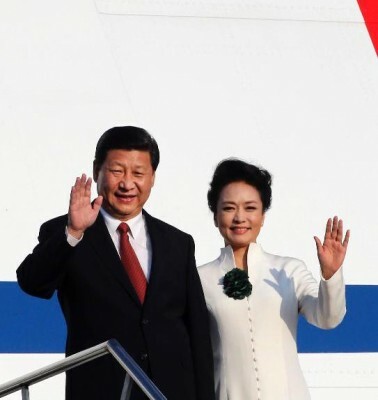 Supra), to President Xi's official inauguration of a grandiose project for terrestrial Trans-Continental Strategic Transport Links via the EurAsian Railroad Network extending from Germany up to China and even South Korea, via Russia (and; in one out of 2 simultaneously possible alternatives, also Kazakhstan) ? Speaking exclusively to "EuroFora", the New EU Parliament's President, former Polish Prime Minister, ChristianDemocrat/EPP MEP Jerzy Busek, welcomed proposals by EuroFora about innovative ways for EU Citizens to attend EU debates before important final decisions which affect people's lives. 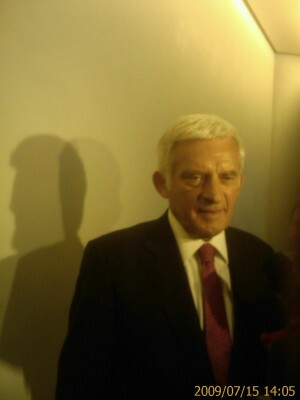 - "We (EU Parliament) must be transparent", Buzek stressed from the outset. "We must have clear answers also for delicate questions. If we don't touch a problem, you must know why, and when shall we decide in the nearest future".. "Because "we (EU) must think about Europeans, first of all : They don't understand well what is going on in the EU. So, it's our duty to inform them, to make discussions here more interesting". "EuroFora" congratulated President Buzek for the anouncement he made, from the 1st day of his election in Strasbourg (on Tuesday, 14 July 2009), on his intention to make transparent debates, exchanges of views, etc. before the final adoption of decisions in EU Parliament's Plenary, when issues are evolving inside Committees, (See earlier publication). - "Thank you. 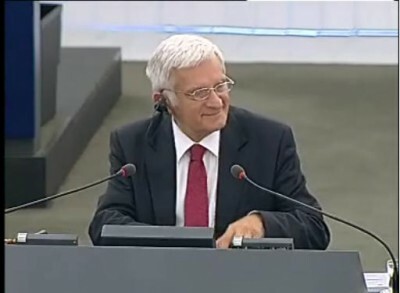 We (EU Parliament), indeed, have exciting debates", Buzek replied. But, in practice, "without a possibility for our Citizens to see them, not even by the Press, the Radio or TV, etc., because it is in Committees", he regreted. - "But, they (i.e. Media, Citizens, etc) might interact with you, with MEPs, etc, May be we can imagine something", "EuroFora" proposed. - "Yes, (but) it needs, a quite new idea", Buzed observed. - "Why not through some innovations ? ", "EuroFora" suggested. - "Innovation ? That's it. Fantastic New Information Technologies ! ", Buzek realized. - "Precisely, "EuroFora" has such a project, since more than a Decade (1997-2009), to use new technologies for public debates before major EU decisions are taken", we reminded. - "If you have such proposals, please come to us, come to us. We must" do something, agreed the new EU Parliamen's President. This fits with Buzek's main stance, expressed at EU Parliament's plenary earlier this week in Strasbourg, that the European Union must succeed to overcome a "Crisis of Trust" vis a vis EU Citizens. (See previous EuroFora publication). 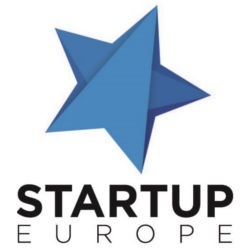 For that purpose, obviously information and debates are valuable, but purely instrumental, procedural means which can help focus on, and highlight a substantial content, attractive to EU Citizens, which needs to be determined by other, political, and not mediatic factors. Buzek spoke about the urgent need to overcome the Global Economic Crisis, the struggle for Human and Civic Rights, Democracy, etc., the Eastern Partnership, links with Russia, strategic partnership with USA and emerging countries, etc. 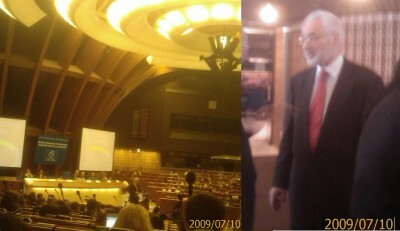 But he also used (while speaking both to "EuroFora" and other Media) the expression : "The Europeans", for EU Citizens. This points right towards what several important EU leaders (including French President Sarkozy, German Chancellor Merkel, etc) have started to highlight particularly during the recent years : That there is a vital need, and an historic opportunity, for the development of a European Conscience, to stimulate e renaissance of a European Identity able to attract Popular support, for the EU to become a strong player in a Multopolar World : In other words, the revitalisation of a project for a "Political Europe". Speaking to more than 650 participants from CoE's member countries, at the conclusion of the 2009 Summer University of its Political Schools, Erhard Busek, (with an "s"), former vice-Chancellor of Austria and EU Coordinator for South-Eastern Europe, pointed at the current need to revitalize Europe's "Identity", forged by Greek philosophy and Roman Law, Christian values and Enlightment's ideas, etc. through the ages. - "We have almost the same name with Jerzy Buzek (EU Parliament's new President, who is a former Polish Prime Minister), because both our Families come ...from the same village, located at the Heart of Europe, which was often shared between Poland, Germany and the Czech Republic. But my family emmigrated a long time ago to Austria, while Jerzy Buzek's family remained in Poland", explained f. vice-Chancellor Erhard Busek to "EuroFora".